Well this really doesn't look good. It's not news that the Academy Awards have lagged behind when it comes to recognizing actors, directors, producers, and other pros who aren't white. The blame for that failure could fall in a few places: our culture at large, risk- and change-averse producers, the oddly regressive dynamics of the Academy voters. Either way, it's not great. 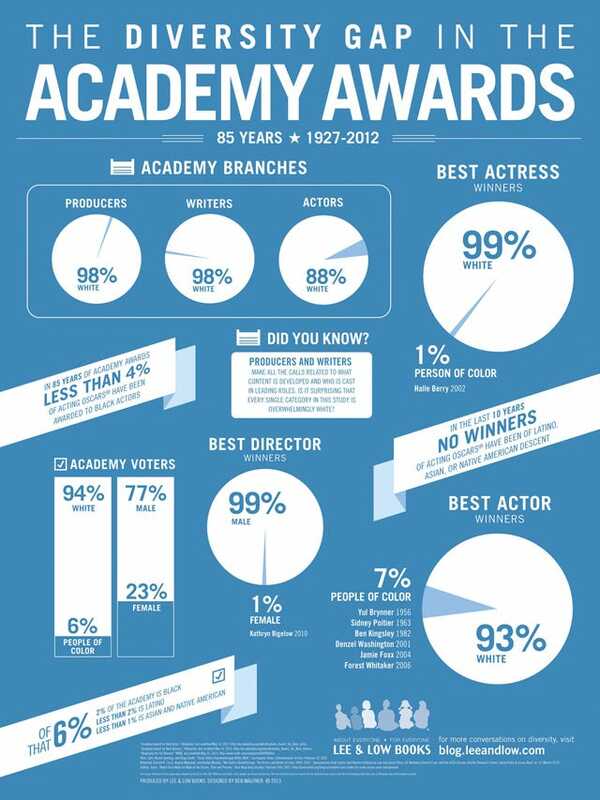 An infographic published on The New York Times' Carpetbagger blog has spelled out the Academy Awards diversity gap in stark, visual terms. Created by children's book publisher Lee & Low Books, the chart reveals just how stacked the deck is against anyone hoping to see a shift in the racial make-up of Oscar winners. One stat sticks out like a very sore thumb: Of the Academy's 85 Best-Actress winners, only one — Halle Berry for 2001's Monster's Ball — has been anything other than white. Photo: Courtesy Lee & Low Books.